Sukkah: A temporary, organic and transient dwelling growing out of Jewish tradition to celebrate the harvest. The sukkah is a Jewish tradition, built during the festival of Sukkot, in September/October. While there are many rituals surrounding the festival, the building, and living in the sukkah is the essence of Sukkot. Traditionally Jews eat all their meals and sleep in the sukkah for the entire week, as well as inviting guests. Symbolically the sukkah is linked to the tent of Abraham, the Biblical paradigm of hospitality, as well as to the chuppah, the Jewish wedding canopy. 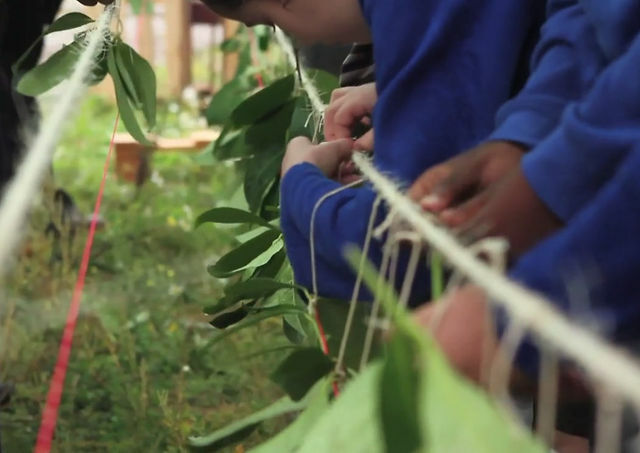 In September 2010, we built a Sukkah in Spitalfileds Farm, in East London with 150 children and activists from all faiths and backgrounds. A temporary, organic and transient dwelling growing out of Jewish tradition to celebrate the harvest. A building across faiths and cultures, coming together under its shelter to share meals, talks, performances and dialogues on food, faith and community. The Sukkah programme included speakers, artists, religious teachers (of many faiths), activists, radicals and mischief-makers to explore and create and explore a temporary and ephemeral society to imagine and dream of alternative ways of living. At the end of an extraordinary week, culminating in dancing to live klezmer in pouring rain and mud, The East London Sukkah came to an end. Talks on veganism, squatting, anti-aviation activism, faith, migration and the French state, radical Judaism, films on UK eco-activism, the Yes Men and Punk Jews, music from klezmer bands, inculding The Merlin and Polina Shepherd Quartet and Muslim poets and activists Poetic Pilgrimage, meals both real and conceptual, and an amazing number of diverse and wonderful participants. The Sukkah was an experiment in public space - one that was defined, yet open. It was an experiment in religion, suggesting a form of religious practice that is neither fundamentalist, nor acquieces to the agenda of the Liberal state. It was an experiment in creating dialogue that is respectful but not superficial. To say that the Sukkah succeeded in all its aims would be trite - its aims were frequently utopian, and so the most it could do was provide a fleeting mirage of better and more durable ways of living. Having said that, those who participated in many programmes during the week testified that a heady mix had been created, and that the experience was a week of huge excitement, creativity, and joy. A huge thank you to Hackney’s amazing support of our East London Sukkah project situated in Towerhamlet’s Spitalfields City farm. It is safe to say that without palettes from Dalston Market, branches and twigs from Springfield and Clisshold park and bark chip from Hackney’s trees, this project would have never been as fantastic as it was. We are especially grateful to Dave O’Toole from Hackney Waste, Darrel Abercrombie, head of Hackney parks and open spaces and Mark, Dean, Jim and Steve from the Hackney Tree Unit and their respective team members who are a pleasure to work with. Artists and designers explore the themes of food and Sukkot. Rabbi Deborah Kahn-Harris gives a talk on the “Four Species,” artist Synnove Fredericks cooks up a “conversation meal” exploring the post-kosher rules of future foods (made with Jarred Henderson of London Harvest), artist Antonia Grant’s creates a “Smell Happening,” with music from Poetic Pilgrimage. A packed weekend of workshops, films and talks to give you tool to create alternative ways of living. Come eat, argue, create and organise! SUNDAY 26 SEPTEMBER 2010 6:30pm FOOD AND FILMS with music from the Deshi Movement and a film programme including: The Yes Men Fix The World, Punk Jews (sneak preview episodes), and Just Do it: Get Off Your Arse and Change the World, a sneak preview, with live commentary from director Emily James. Our final night will be a celebratory forum, a place to consider how to take the ideas from the sukkah further. Employing techniques from traditional Jewish learning in a new way we’ll attempt to build a consensus for a way forward. With delicious vegetarian food using the harvest grown in Spitalfields City Farm with the pop-up restauranteers, Rambling Restaurant, music by Vivi Lachs and Klezmer Klub, and folk chanteur Sam Lee! Heather Ring (Project Lead / Designer) is a landscape architect, with experience producing both large-scale public realm projects and socially engaged public artworks. She is the founder of The Wayward Plant Registry, which creates pop-up shops, temporary gardens and community exchanges. Her work has been included in exhibitions at the Barbican London, The Canadian Centre for Architecture Montreal and the Graham Foundation Chicago. She recently was commissioned by The Architecture Foundation to design and produce The Union Street Urban Orchard for the London Festival of Architecture, transforming a derelict site into a productive community garden made entirely of recycled materials and built by over 100 volunteers. Abbas Nokhasteh (Co-Producer / Lead Funder) is the founder of Openvizor, an international arts and cultural organisation and platform that supports and manages collaborative projects and practice development across borders, cultures and disciplines, connecting and celebrating individuals, communities and organisations around the world. Openvizor programme includes exhibitions, festivals and projects with institutes, academia and practitioners in urbanism, fine art, performing arts and film, cultural activism and heritage in Europe, the Americas, Middle East, Africa and Asia; in 2010-2011 there are collaborations in London, Istanbul, Paris, Amman, Kingston, Bogotá, Dhaka, Buenos Aires, Cape Town, Ramallah and Doha. Orly Orbach (Artist) is an artist that constructs visual narratives, often through a range of collaborative and interactive processes. Her work includes public art-trails, consultations, museums interpretation, murals, residencies and workshops for schools, galleries, museums, theatre companies and festivals. Based in London, Orly Orbach graduated from the Royal College of Art in 2003. Previous clients in include Museums Sheffield, Hayward Gallery, Royal Festival Hall, Camden Arts Centre, South London Gallery, Creative-Partnerships, Elevate and the Bront? Parsonage Museum. Thomas Kendall (Designer) is a graduate of The Bartlett and worked as assistant project manager for The Union Street Urban Orchard, as well as designing and building the Indenti-kit Urban Playground, a children’s interactive pavilion for the Student Showcase of The London Festival of Architecture. - a temporary, fragile structure, built at the end of harvest in the autumn. - a dwelling that offers shelter but lets you see the stars through the roof. - a structure built of natural materials, a house of plants and branches. - a home for 7 days, where, you eat, sleep, party and make love. - a parody of a house, a satire on construction. - a site where the lord of the manor becomes closer to the man who sleeps on the park bench. - a temporary autonomous zone. - a place of meeting, of radical hospitality. - a place of our joy. All are symbols of openness, of welcoming, and this is appropriate to Sukkot’s status as a universalist festival. In the time of the Temple in Jerusalem, 70 bulls would be sacrificed on Sukkot, representing the nations of the world. The temple and sacrificial system is gone but the universalist tradition remains. We take our cue from this – building a sukkah that is not purely a space for Jews but for all to meet, eat, talk and create. There is a vast barrage of rules surrounding the construction of the sukkah. These range from the reasonable, such as making sure the structure is strong enough to withstand wind, to the ridiculous, such as the fact that a sukkah can be built on an elephant. The bulk of the laws, however, are dedicated to preserving the sukkah’s essential function – to be a place of shelter, but not too much shelter. The roof must be made entirely of organic, natural material in an untreated form. This ensures that the structure can never entirely exclude the outside world, and is permeated by the outside climate, as well as by rain. This gives it a character of a middle ground; to one who normally sleeps on the streets it offers relative comfort and shelter, to one who normally dwells in a secure house it seems exposed and unprotected. A sukkah that is too enclosed, too detached from the elements is simply not a sukkah. The best observed tradition surrounding the sukkah is to hold meals in it, and in particular, to invite guests. Our sukkah builds on this tradition, open to all to want to eat, talk, interact and dwell in this unique space. One of the festival’s alternative names is chag ha’asif, the festival of gathering. We hope to gather many diverse groups of people in our sukkah, both those that can spare time to eat, and those who simply want to pay a brief visit to this unique site. The sukkah is an inherently Utopian space – a place of hospitality, of meeting, of being surrounding by nature. 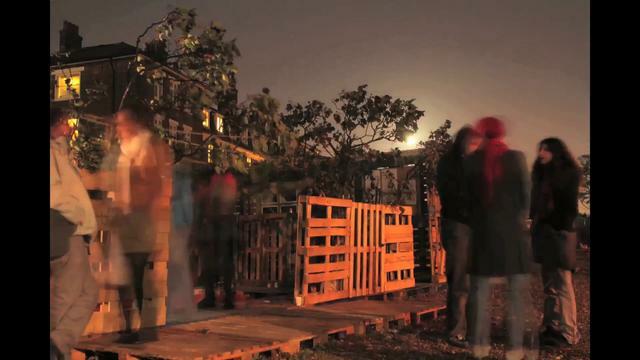 The East London Sukkah takes this idea further – imagining the sukkah as a ‘temporary autonomous zone’, a place where we can imagine, and discuss a world after oil, financial meltdown - a post-capitalist society. How will we live? How will we rebuild a connection with ‘nature’? How can we eat, provide shelter and gain warmth? Throughout the week we explored visions of a simpler, more ethical society, one that could sustainably survive into the future. We are assembling a battery of speakers, artists, religious teachers (of all faiths), activists, radicals and mischief makers to explore these issues and create a temporary and ephemeral society to imagine and dream of alternative ways of living. Jewdas is a radical Jewish/Post-Jewish collective dedicated to satirising much of the Jewish world and suggesting imaginative and outlandish paths that Judaism might take. At much at home putting on squat parties and studying Torah, equally interested in the East End Anarchists and the Zapatistas, Jewdas veers from the frivolous to the profound in an instant and is never content to stay still for long. At the heart of its work is a forceful reclaiming of Jewishness from its conservative advocates, and restoring the great traditions of its dreamers, subversives, cosmopolitans and counter-culturalists. Whatever your background if you: prefer stirring things up to keeping the peace, prefer dreaming of the utopian rather than settling for the prosaic, and think that culture and ethnicity should be springboards for overthrowing the state, then you’re a Jewdaser at heart. Let’s storm the barricades together. Openvizor is the co-producer and lead funding partner of The East London Sukkah. Openvizor is an international arts and cultural organisation and platform that supports and manages collaborative projects and practice development across borders, cultures and disciplines, connecting and celebrating individuals, communities and organisations around the world. Openvizor plans for 2010 include a new online platform with our own technology focusing on the dynamics of collaboration. We continue our programme of exhibitions, festivals and projects with institutes, academia and practitioners in urbanism, fine art, performing arts and film, cultural activism and heritage in Europe, the Americas, Middle East, Africa and Asia; including collaborations in London, Istanbul, Paris, Amman, Kingston, Bogotá, Dhaka, Buenos Aires, Cape Town, Ramallah and Doha. The Wayward Plant Registry is a collective of landscape architects, architects, artists and guerrilla gardeners that create temporary gardens and social exchanges. The Registry has been included in the exhibitions Radical Nature: Art and Architecture for a Changing Planet at the Barbican London, and Actions: What You Can Do With the City, at the Canadian Centre for Architecture Montreal and the Graham Foundation Chicago. Recently, the Registry designed and produced The Union Street Urban Orchard, co-delivered with The Architecture Foundation and the London Festival of Architecture. The Kindest Group are designing and delivering intentional spaces of kindness. Spaces are kind when they actively foster consideration, cooperation, communication and conciliation. These spaces can exist in the material or virtual world but usually embrace both.